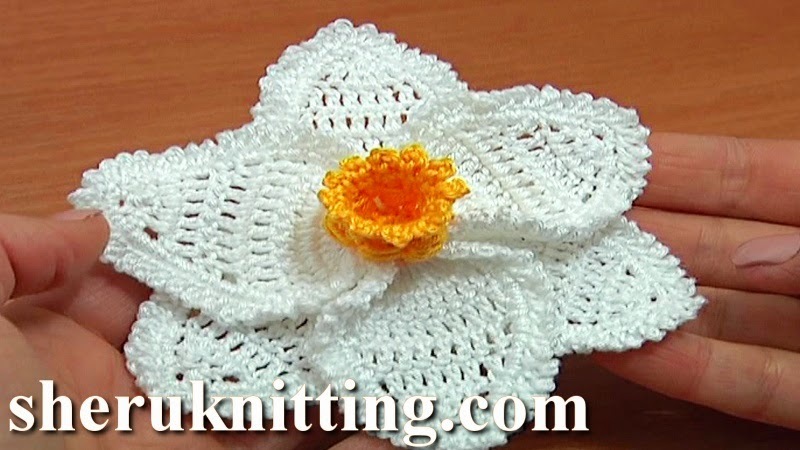 This detailed crochet video tutorial will help you to crochet a beautiful narcissus (daffodil) flower. The center for this flower we made in crochet flower tutorial 68 part 1. In this tutorial we continue the work crocheting two layers of petals. Each layer has 3 petals and works of double crochet stitches. Around each petals we made a single crochet and picot trim. You can choose to make just a single crochet trim all around 2 layers of petals which is much easier but the result will be the same beautiful. To show you the difference for demonstration we made the flowers in both versions. Enjoy! And thank You for watching! Crochet flower is made of 100% Cotton Mercerized, 169m/50g,4 ply; and with Steel Crochet Hook 1.5 mm or 2mm (#8 or #4 US standards).